Hawks owner Bruce Levenson’s email reveals how Atlanta’s sports franchises think about race. 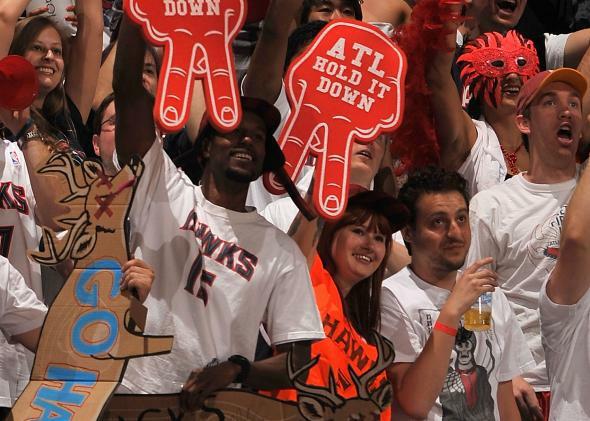 Atlanta Hawks fans cheer at a playoff game in 2010. In the 1960s, Atlanta earned the nickname “The City Too Busy to Hate” due to its (relative) progressivism on racial issues compared with other Southern cities. Now, 50 years later, it fancies itself the capital of the “New South,” a place that’s bursting with opportunity for people of all races. If only the story of race in Atlanta were that comforting and simple. It’s no accident that strained race relations have now come to define the Atlanta sports scene. Ask Atlantans for the defining characteristic of the city’s pro franchises, and they’ll probably tell you that it’s repeated failure when the games count the most. But off the field, the one thing all these teams have in common is their inability, and often unwillingness, to grapple with race in a humane, meaningful way. Levenson announced on Sunday that he was selling his interest in the team, apologizing for sending “the unintentional and hurtful message that our white fans are more valuable than our black fans.” But it’s not as if Levenson is a unique figure in Atlanta sports. This message that the Hawks owner apologized for delivering—that white fans are more valuable than black ones—is the exact one the Atlanta Braves have been broadcasting for the last several years. Major League Baseball’s Braves, like the Hawks, play in a stadium downtown. That won’t be the case for that much longer. In 2017, the team is moving to a new stadium in suburban, mostly white Cobb County. The deal for that facility was struck largely in secret. “If it had gotten out, more people would have started taking the position of, ‘We don’t want that to happen,’ ” Braves President John Schuerholz explained. Braves executives have said the club’s current park, Turner Field (which was built for the 1996 Olympics), is broken down and outdated. Its location in an urban neighborhood—one that is often described as dangerous—also “doesn’t match up with where the majority of our fans come from,” according to the team’s vice president of business operations. While the franchise has supported that assertion with a heat map of season ticket holders, one that shows that Atlanta’s northern suburbs are teeming with Braves fans, it’s also not hard to spot the racial coding here. Unlike the Hawks, the Braves don’t seem troubled by the presence of black fans—they just don’t seem to care all that much about them. Rather, the team wants to focus on catering to its white, suburban clientele and isn’t concerned about alienating its smaller black fan base. Black culture has thrived in Atlanta for a very long time. Back in the 1930s and 40s, the Sweet Auburn Business District was rocking and the Daily World reigned as an influential, authoritative black newspaper. Today, Atlanta has more black residents than any metro area aside from New York, with countless celebrities (including a huge number of athletes) and affluent Northerners moving to town in the last decade. This is a fantastic business opportunity that Levenson failed to understand or embrace. In his 2012 email, Levenson wrote that the Hawks’ majority black crowd was out of character for the NBA: “Even [Washington] D.C. with its affluent black community never has more than 15 percent black audience.” (Levenson’s ownership group is based in the Washington area, though his team bio says he has a home in Atlanta in addition to his residence in Potomac, Maryland.) Rather than see this as a great opportunity to market to a well-to-do black audience, Levenson claimed in his email that “many of our black fans don’t have the spendable income” to buy merchandise. When he saw an arena full of black fans, he presumed that this was a problem that needed to be fixed—that his only route to success was to cater to the suburban “white guy.” That assumption ends up looking very bad no matter whether it’s expressed in stark emails (Hawks) or in clandestine back-room deals (Braves). The unifying principle here isn’t just black and white—it’s green. The Braves consulted a heat map of their season ticket holders and chased their wallets, tradition, and convenience be damned. Levenson viewed rows of empty seats as a symptom of racial animus and a sign of his inability to sell a “black” product to white fans. And when you think about the money first, the fact that he’s now unloading his share of the team shouldn’t be viewed as much of a punishment. Levenson tried to sell the team back in 2011, but that deal—to a Californian named Alex Meruelo who would have become the league’s first Latino owner—was scuttled by the league office at the last minute. It wouldn’t surprise me if Levenson sees this embarrassing email as his ticket out, and that he doesn’t mind being lumped in with the disgraced Donald Sterling—who got $2 billion for the Clippers after the NBA forced him to sell—so long as his golden parachute flies in the same section of the sky. While the conversation around the Hawks and Braves has been as much about demographics and urban planning as wins and losses, the NFL’s Falcons offer another window into the city’s racial rift. The Falcons, too, are moving to a new stadium, one that’s still in downtown Atlanta. (It was his prior commitment to a Falcons stadium deal—one that will require a $200 million municipal investment—that pushed Mayor Reed to reject any public outlay for a new Braves ballpark.) While the franchise, led by owner Arthur Blank, is staying inside the city’s perimeter (“ITP” to the locals), it’s relocating from an area considered by many to be “too black” to attract white fans. And in the name of snagging larger profits from a surrounding entertainment district, the team is razing a pair of historic black Baptist churches in the vicinity of the new stadium. The symbolism there isn’t pretty. When it comes to on-field matters, winning cures all, at least temporarily. If Ryan keeps up his incredible play and leads Atlanta to the Super Bowl, he’ll be embraced by every Falcons fan regardless of race and class. Indeed, if any of these local teams would win a championship, a feat that has eluded the Braves, Hawks, and Falcons for all but one of their 142 collective, full seasons in Atlanta, then the whole city would be dizzy with happiness. But once that winning feeling fades, a fundamental reality persists. Atlanta’s stadiums and arenas aren’t forces for unity in a divided city. They are battlegrounds, and they will remain that way for a very long time.